In the ruin of the Roman Empire, her laws were lost in the general wreck. During the two hundred years, which followed the reign of Constantine the Great, Europe was a scene of every calamity, which the inroads of barbarians could inflict, either on the countries through which they passed, or those in which they settled. About the sixth century, Europe obtained some degree of tranquillity, in consequence of the introduction of feudalism; the most singular event in the annals of history. At first, it produced a general anarchy; but the system of subordination upon which it was grounded, contained in it the germ of regular government, and even, of jurisprudence. Its effects were first visible in the various codes of law which the barbarous nations promulgated. Such are the Salic, the Ripuarian, the Alemannic, the Burgundian, the Visigothic, and the Lombard laws. A complicated or refined system of jurisprudence is not to be looked for in them; but, if they are considered with due regard to the state of society for which they were calculated, they will be found to contain much that deserves praise. The capitularies, or short legislative provisions, propounded by the sovereign, and adopted by the public assemblies of the nation, were a further advance in legislation. By degrees, so much regularity prevailed in the judicial proceedings and legal transactions, that they were regulated by established formularies; and, in addition to those provisions, every nation contained a collection of unwritten usages or customs, which had the force of law. The natural tendency of these institutions to introduce order and peaceful habits into society was great; but it was so much counteracted by the turbulent spirit of every class of men, that it was not till the beginning of the thirteenth century that this effect of them became discernible. From this time, the governments of Europe sensibly improved. A better spirit of legislation shewed itself; the administration of justice became more regular; trade and husbandry were protected, several arts were encouraged; and a general wish for a better order of things prevailed in every part of Europe. While the public mind was in this state of improvement, an event fortunately happened, which gave it a very salutary direction. This was, the discovery of a complete copy of the Pandects of Justinian at Amalfi, a town in Italy, near Salerno. From Amalfi, it found its way to Pisa; and in 1406, was carried to Florence, where it has since remained. Few events in history can be mentioned which have conduced more to the welfare of Europe than this discovery. The codes, the capitularies, the formularies, and the customs, by which, till that time, the feudal nations had been governed, fell very short of affording them the legal provisions, which society, in the improved state of civilization, to which it was then advancing, evidently required. Unexpectedly, a system of law presented itself, which seemed to contain every thing that the most enlightened men of those times could have desired. The wisdom and justice of the system of law expressed in the Pandects seem to have been universally felt. The study of it was immediately pursued with ardour. It was introduced into several universities; exercises were performed, lectures read, and degrees conferred in that, as in other branches of science; and most of the nations of the continent adopted it, if not as the basis, at least as an important portion of their civil jurisprudence. A regular succession of civil lawyers followed. At first, they rather incumbered the text with their subtleties, than illustrated it by learning and discrimination. Andrew Alciat was the first who united the study of polite learning with the study of the civil law: he was founder of a school called the Cujacian, from Cujas, the glory of civilians. Of him, it may be truly said, that he found the civil law in wood and left it in marble. This school has subsisted until our time: it has never been without writers of the greatest taste, judgment and erudition; the names of Cujacius, Augustinus, the Gothofredi, Heineccius, Voetius, Vinnius, Gravina and Pothier, are as dear to the scholar as they are to the lawyer; an Englishman however must reflect with pleasure, that the Commentaries of his countryman, Sir William Blackstone, will not suffer in a comparison with any foreign work of jurisprudence. So far as the researches of the present writer extend, the only one that can be put into competition with them, is the Jus Canonicum of Van-Espen. The judicial process of the nations on the continent differed considerably from that of England. Trial by jury, and separate courts of equity, were unknown to them. Some causes were heard and decided by all the magistrates of the courts; others were referred to one or more of their number. The king's advocate, or the advocate of the state, as he was termed in a republic, held a situation between the judges and the suitors: his province was to sum the facts and arguments of the cause, and to suggest his opinions upon them to the judges.-We trust our readers will excuse this summary view of foreign jurisprudence. Grotius, born in the city of Delft in Holland, by the advice of his father, addicted himself to the profession of the law. He was only in his seventeenth year, when he pleaded his first cause. He acquired by it, great reputation; and this was constantly upon the increase, through the whole of his professional career. He observed in his pleadings a rule, which he afterwards recommended to his son: "That you may not," he told him, "be embarrassed by the little order observed by the adversary counsel, attend to one thing, which I have found eminently useful: Distribute all that can be said on both sides, under certain heads; imprint these strongly in your memory; and, whatever your adversary says, refer it not to his division, but to your own." 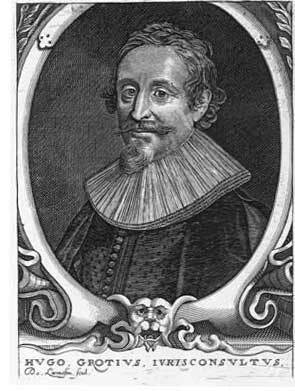 The brilliant success of Grotius at the bar soon procured him very considerable promotions. The place of Advocate-General of the Fisc of the provinces of Holland and Zealand becoming vacant, it was unanimously conferred on him. This situation was attended with great distinction and authority; the person invested with it, being charged with the preservation of the public peace, and the prosecution of public offenders. In 1613, Grotius was advanced to the situation of Pensionary of Rotterdam; and his high character authorized him to stipulate before he accepted it, that he should hold it during his life, and not, at will, its usual tenure. It immediately gave him a seat in the assembly of the States of Holland; and, at a future time, a seat in the assembly of the States General. Between the time of his appointment to the advocacy of the Fisc of Holland and Zealand, and his being appointed Pensionary of Rotterdam, he married Mary Reygersburgh, of an illustrious family in Zealand. It proved a marriage of happiness. The most perfect harmony subsisted between Grotius and his consort: we shall find that she was an ornament to him in prosperity, his comfort and aid in adverse fortune. The marriage was solemnized in July 1608, and celebrated by many a Belgic bard. A dispute arising about this time between England and the States General, upon the exclusive right claimed by the former to fish in the Northern seas, the States, with a view to an amicable adjustment of it, sent Grotius to England. Several meetings took place between him and commissioners appointed by James, the British sovereign. If we credit the account, given by Grotius, of the point in dispute, and the negociation to which it gave rise, justice was decidedly on the side of the States General; and England only carried the point by the lion's right,-the droit du plus fort.